Sometimes the simplest of dishes can wind up being the most loved. Enter this humble spinach dip. 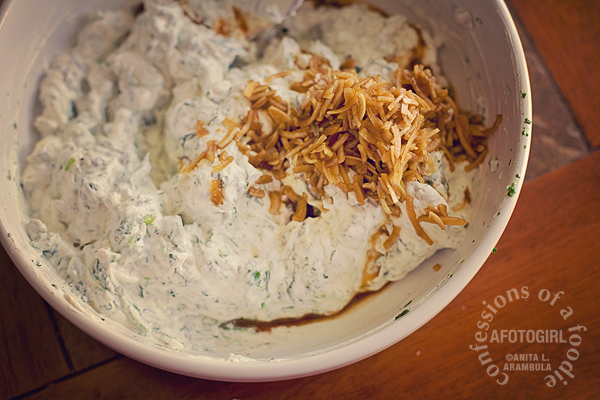 The same friend who showed me how to cook spaghetti squash, showed me how to make this dip. The first time I took it over to my parent's house for a family gathering, I had to convince the spinach haters to just give it a whirl before walking away. It's now my family's most requested recipe. I take it to pretty much every family gathering and make enough to leave them with after the party is over (yes, it even made an appearance at our Easter celebration which is when these photos were shot). It's simple, decadent and satisfying. I've used my leftovers as a sandwich spread and to stuff an omelet along with lots of fresh veggies (mushrooms and lightly blanched asparagus are my favorite omelet additions when using leftover dip). Give this dip a whirl yourself and let me know in the comments if you successfully convert any spinach haters in your circle. Measure out water in a microwave safe measuring cup. Add soup mix. Microwave for 1 minute. Carefully remove and stir well. Set aside to cool. Place spinach in a fine mesh sieve and run under cold water to break up any ice crystals. Place in a microwave safe bowl and microwave for 30 seconds for a quick thaw. Place spinach in a cheesecloth (or go the lazy route and use a paper towel which is what I normally do when I don't feel like hunting down my cheesecloth). Gently squeeze out all the liquid. Return to bowl. 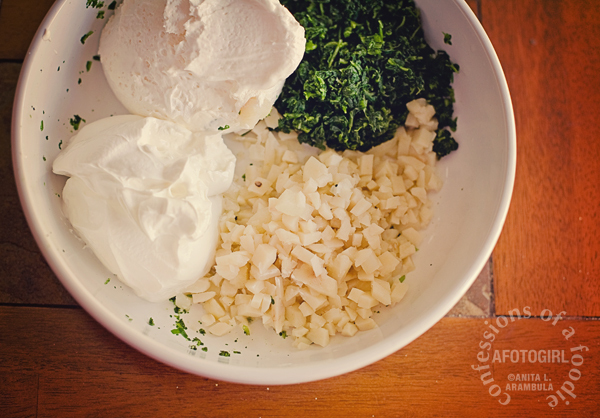 Add cream cheese, sour cream and chestnuts. Stir well to combine. Using a fork, pull out all of the onions from the cooled soup and add to the cheese mixture. Add half the liquid. Stir and taste. If you want less saltiness, this might be enough of the soup for you. I use all the soup because I enjoy the flavor it lends the dip. It's personal preference at this point. Stir well and set aside. Using a bread knife, slice the top off the bread round then run the knife around the inside of the bread leaving at least an inch of bread in what will be your serving bowl. Then scoop out the bread in one large chunk if possible leaving about an inch of bread on the bottom of the bowl. 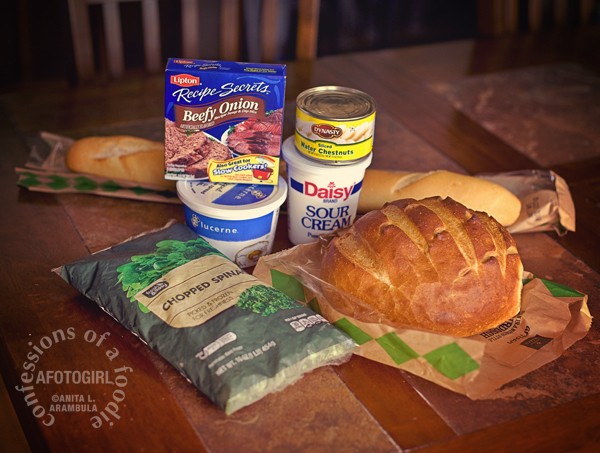 Add the dip to the bread bowl. Place any leftover dip in the fridge to replenish as needed. Chop the removed bread into 1 inch cubes. 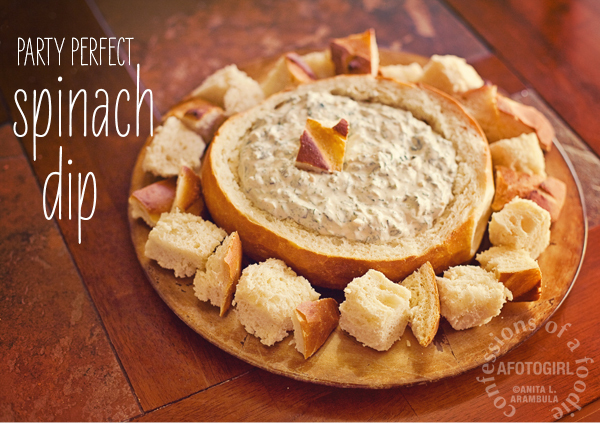 Place your bread bowl on a serving platter and surround the platter with the chopped bread cubes. Cut the baguette into 1 inch thick slices then make 1 inch cubes from the slices. Use this bread to replenish the bread cubes as needed. Note: You can easily lighten this up a little by using reduced fat sour cream and cream cheese which I normally do but didn't this particular time.